Make a Donation! Thank You! The Richard Knights / Sue Kaderli Memorial Fund is named in memory of two lifelong residents of Orleans County. In 1994, the Knights and Kaderli families merged their separate memorial funds. It was the wish of both families that the money raised be used to provide financial support to Orleans County cancer patients and their families. Funds thus far have assisted families with nutritional supplements and prescriptions, as well as medical supplies and bills. Funds are raised through an Annual Walk/Run, Zinkievich Wine-Tasting, David Millis Golf-Tournament, Pink Crystal Ball, Cancer Bracelet sales and various other contributions made by individuals, organizations and memorials. The Richard Knights / Sue Kaderli Memorial Fund is a tax-exempt organization under the Internal Revenue code section 501(c)(3), and run by a board of directors. 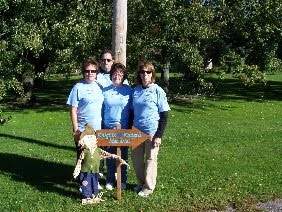 There are no administrative costs, thereby allowing 100% of money raised to be used for the benefit of Orleans County cancer patients. All inquiries are completely confidential.